Some of the most painful moments from my childhood music education classes were concerts which Soviet establishment put together to pretend the USSR was a community of friendly loving nations. During those concerts every nation/region took turns to present their native music. The most excruciating were performances from Middle Asia, so called “Stans”, which were based around long repetitive melodies played on native 3-string pinch instruments. Little did I know at the time that this music was reflection of the austere living environment these peoples endured throughout history. Having gotten smarter with age I am now much more tolerant and am actually interested in music coming from unusual far away places, especially if such folk music bears a metal arrangement to boot. 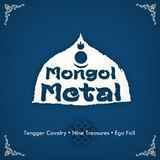 Mongol Metal by three bands Tengger Cavalry, Nine Treasures and Ego Fall is exactly that type of album. With all three bands having their roots in the Inner Mongolia region of China, it must have been not easy to put this release together, so the three collectives joined in on a tri-split. Of course I was not present in the room when these arrangements were made, but if all three bands agreed to provide quality, authenticity, energy and make their music definitely metal, all three of them succeeded. How to listen to Mongol Metal is up to you. Roll through the songs in order, or pick a band and follow it first throughout, then continue on with another contributor, either way you will get a good fix of energetic rhythmic music inspired by nomadic lifestyle of the steppe. If you did not know Ego Fall was from Inner Mongolia, the first few notes of Wind the Horn, Back to the East or The Legend may be confused with melodic Finnish folk metal, as shaman/herder chants (Wind the Horn, Back to the East), use of violin or some other native instrument (Wind the Horn) definitely provide this feeling. I heard some ethnologist connecting Finns with the Siberian tribes of Komi, Mordva and Mari, and those guys claim descendancy from Genghis Khan, so no wonder there could be connection. The Legend can even remind of old Ensiferum, if the Finns were transplanted into a different folk territory, but elsewhere Ego Fall shifts to more modern groove (Back to the East), goes for a splash of keyboards (Wind the Horn), and with exaggerated screams can even be classified as some folky metalcore (Back to the East). The combination of keys, harsh slamming rhythms and screams make Ego Fall sound almost industrial, something you could hear from … And Oceans, if it were to employ a violin break here and there (Soul Judgment). Nine Treasures is the most folky of the group, and the only one to sing in Mongolian, or at least I do not understand the word they are singing. Rhythmic drum rolls and the groove of Tes River’s Hymn can win over the crowds, and scratchy voice may make Korpiklaani seek for a backup to Jonni Jarvela amongst the Nine Treasures crew. The band is not afraid to show the range, is the only one who goes for mid-tempo on Fables of Mangas, makes excellent use of that pinch string instrument I dreaded hearing in my childhood in Arvan Ald Guulin Honshoor, and overall leaves us on a dreamy note with that track. A little bit more melodic variety and Nine Treasures can touch Korpiklaani, but I guess the monotony of the Mongolian flatlands just don’t allow to diversify significantly. If Nine Treasures is the most folky and Ego Fall is the modest modern, then Tengger Cavalry is the most seasoned of the bunch. Not that they existed the longest, all bands are of about the same age, but Tengger Cavalry simply sound the best-rounded. Their riffs are the tightest gallop (War Horse, Horseman), but they still manage to blend the native motif, and do the most soloing (War Horse, Expedition), which pushes them forward somewhat. Tengger Cavalry is the most technical, whether they are fast (Expedition) or epic, starting out with a grandiose entry while slowly exposing the darker side (Legend on Hoseback). When Mongol Metal came with a tag ‘ready to be surprised’, I smiled wryly, thinking that just about any band would say that, hoping to introduce themselves to a bigger audience. Yet the split does exactly that, firmly reserving a place for Nomadic Metal among folk oriented extreme music.